My son is nine years old and wants to be Santa Claus when he grows up. He makes presents for Santa every year. He has a light-up Santa face in his bedroom window, as well as “Welcome Santa” signs taped all over the walls of our house, the windows (outwardly facing), and even on the banister heading up the stairs to the second floor. He makes presents for others and rarely buys them. 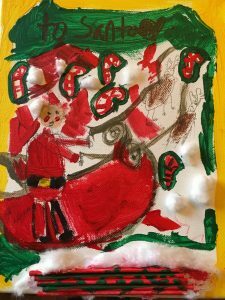 This year, he asked me to buy him canvas and he painted Santa a 3-D Christmas scene to take back to the North Pole to hang on his wall. I might be biased, but it is a great painting. He gathers his toys and takes them to shelters for kids who don’t have much this time of year. He enjoys helping others. My son has very specific goals for himself. He wants to be Santa when he grows up. He wants to help people. He wants to make children happy. I step back and look at my son and think this kid is wiser than his years. He knows what he wants, he actively works for it, and lives his dream. During this season, I offer a personal challenge. Take a step back and think about what you want to be when you grow up. What are your goals this season? How can you make your dreams come true? Enjoy the moment and enjoy this time of year. Kathleen Federici, MEd, is IPI’s director of professional development (and maybe mom to the next Santa).